This screencast goes back to basics and explains usage and customization of the OS X dock along with a very nice little terminal command to give you a recent applications/recent documents icon in your dock. 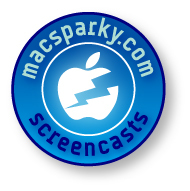 I want to give special thanks to my friend Don McAllister, the godfather of Macintosh screencasting. Don showed pity on me and gave me some excellent screen resolution advice that helped make this new format look even better. You can download it in iTunes or at the Libsyn Feed Right Here.